"Where and when" is the likely the next question after you say yes. 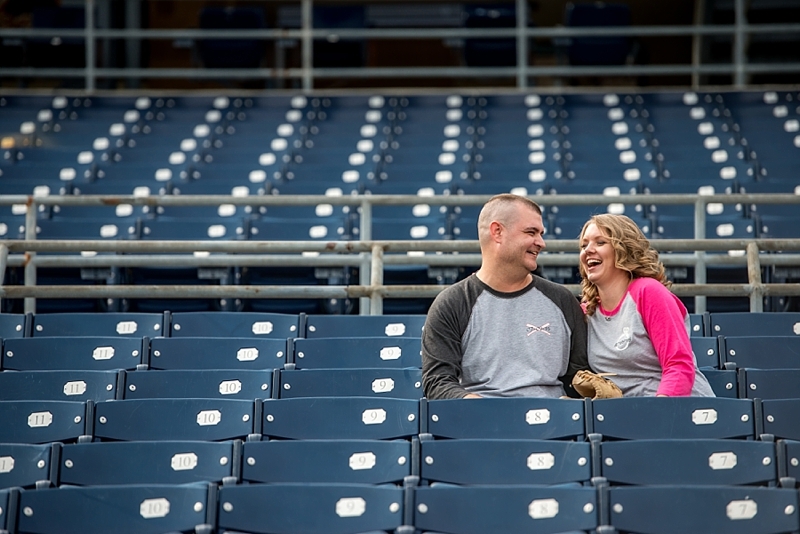 And it's not just typically for the big day venue, but also for your engagement session with your wedding photographer. From varying personalities to personal favorites to lifestyle loves, there are so many options from which to choose that it can definitely be a bit overwhelming. 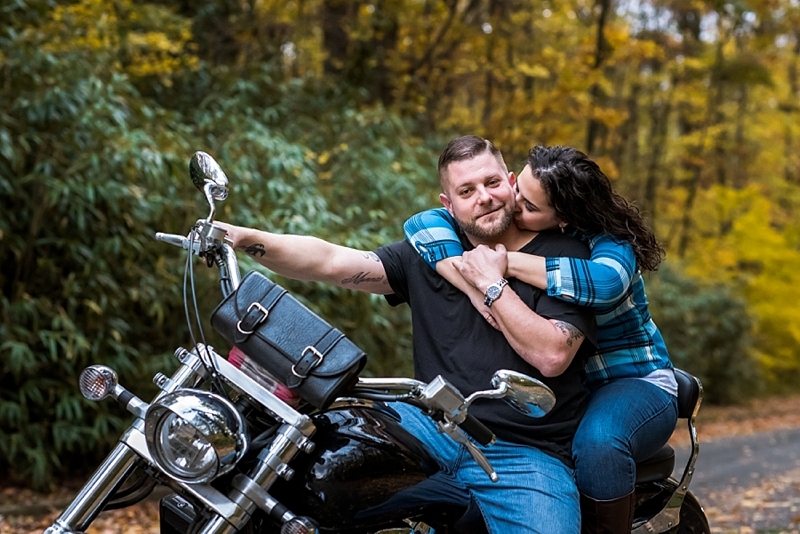 Thankfully we have expert vendor fam, Linda of Awesomesauce Photography, to share her years of photographer's insight on how couples can figure out the perfect "where and when" as it relates to their engagement session. The location and time should be unique to you, so we'll let her take it from here! 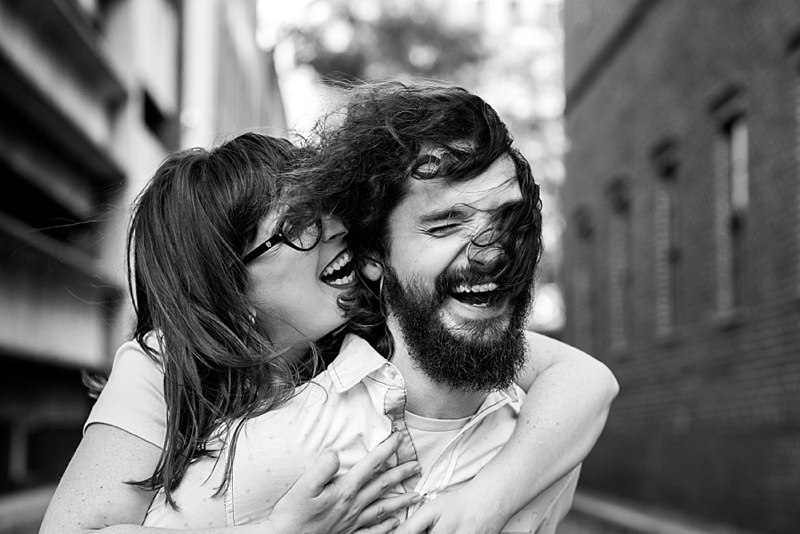 Just got engaged and ready to book that first camera time together with your wedding photographer? 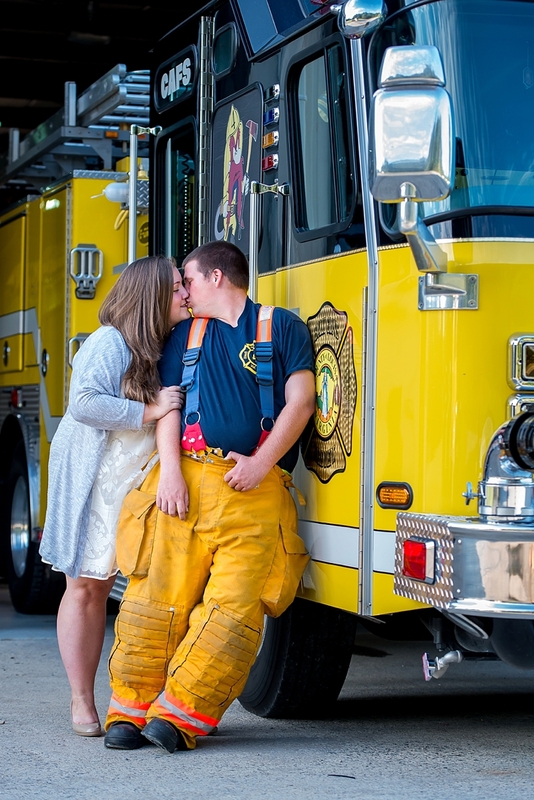 First, consider what you want to accomplish with an engagement session. Some couples use it to get to comfortable with their photographer, make save the dates, to show off that sparkly ring on social media, or even to get images for their personalized wedding website. 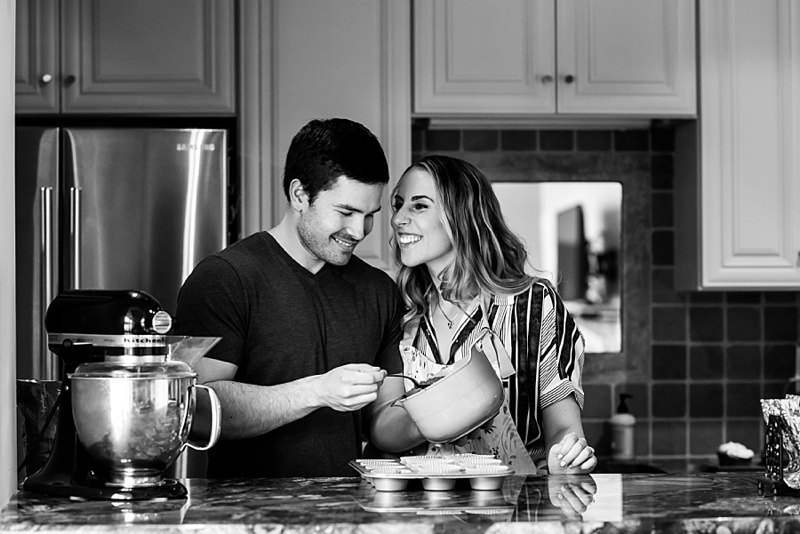 These are all great reasons to schedule an engagement session, but how exactly do you go about selecting a location that showcases who you are as a couple? As a seasoned pro who has been honored to capture so many beautiful love stories, these are my top ten tips on how to decide that special spot and some inspiration that other lovebirds have done in the past! Whether it is tailgating on Sundays with your favorite football team, still rooting from your seats even when your team is on a losing streak, or even searching for that ever-eluding Pokémon Go, having your partner by your side makes watching the wins or loses that much sweeter. Graffiti wall murals that are bold and colorful can be great for the laugh out loud type. 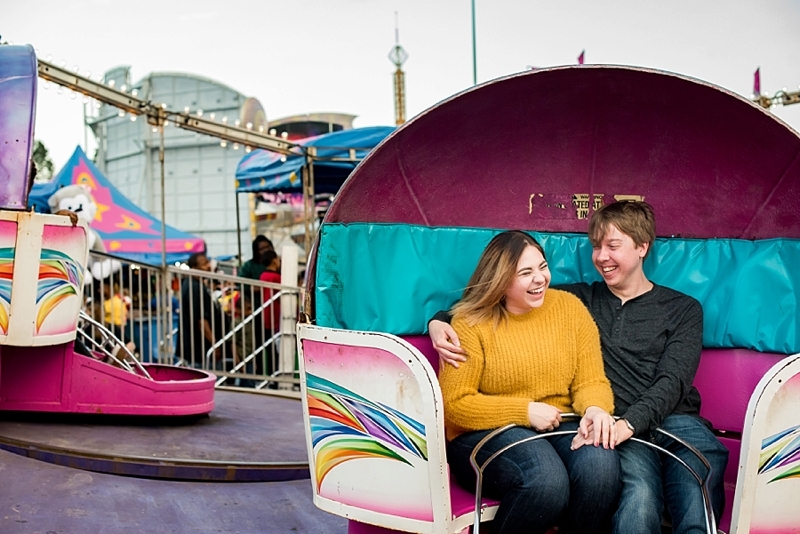 Amusement parks are the perfect fit for adrenaline junkies. Or perhaps you and your significant other prefer a more laid-back style of sipping wine while watching a tranquil sunset? Matching the vibe of the setting to your disposition is always a win. Maybe it's chilly out and snuggling under a blanket with a warm cup of coffee is your go to weekend activity. 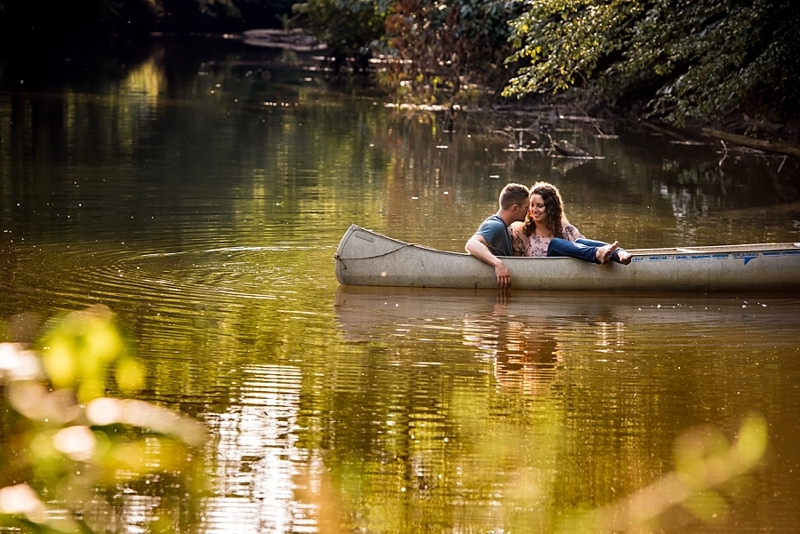 In the heat of summer, a romantic canoe ride down the river could be the perfect romantic setting. For fall lovers, a walk through the sunflowers or autumn leaves will always be a classic. You had a spot selected but now the forecast is calling for rain, and rescheduling is not an option or is inconvenient. Who needs another sunset picture? I urge you to not be afraid of the rain. Inclement weather forces you to get close and think outside the box. Overcast days can make the most gorgeous black and white photos, too! In-home lifestyle sessions can be so relaxing. Try to stash any clutter like that stack of mail out of eye sight or make the bed, and you have your own setting unique to you! If you feel you don’t have a well-lit space, renting an AirBnB is always an option. Give me all the furbabies, cats included! They are an integral part of your everyday life, so let them join in on this momentous occasion, too. 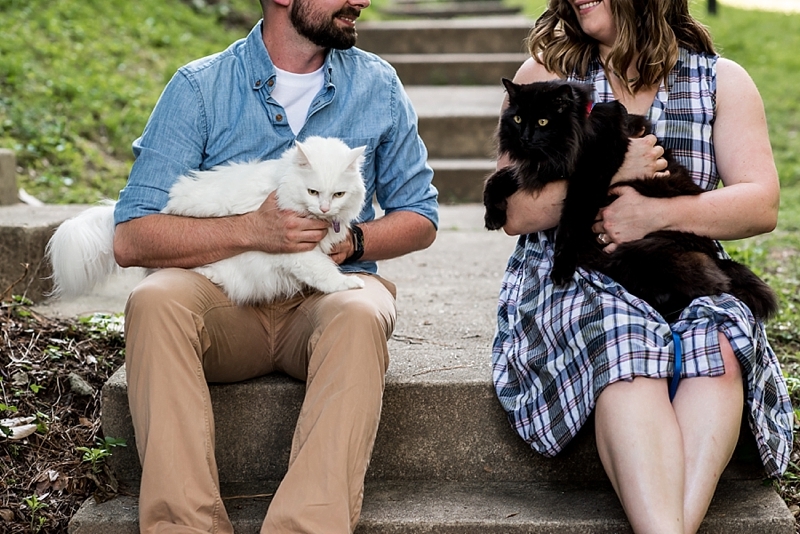 A session with your cats may need to be in your home, and that makes for a fun in-home session as mentioned above. 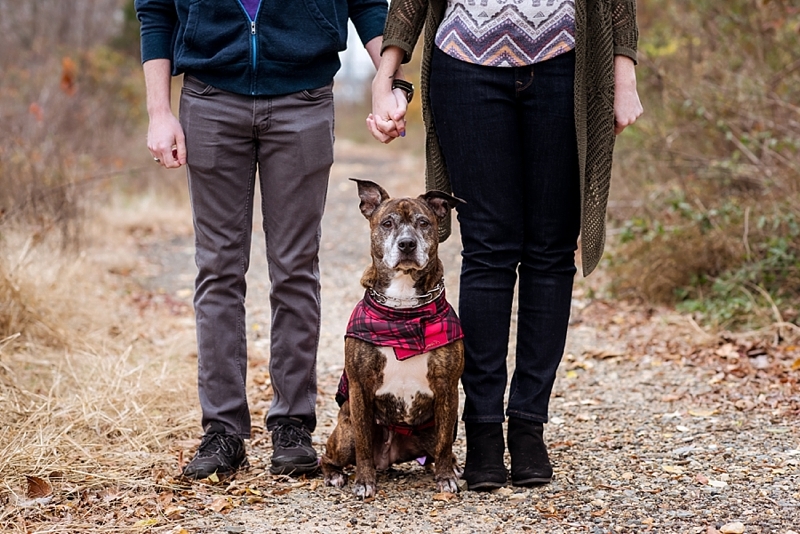 If you have an energetic dog the trick is to bring a puppy wrangler (aka family or friend) with you to help get their attention or to hang onto the pup while other photos are in progress. The one who holds the treats always becomes a favorite human! Does your partner have a baby of the 4-wheel type? He or she may be more cooperative about photos if they can include his motorcycle or her truck in the photo shoot. This way you two are surrounded by some things you or they love most. Going back to the roots of where you first locked eyes could be a great way of immortalizing the moment in photos. When you tell your future grandchildren your story, you’ll have some fond visual memories to show them. 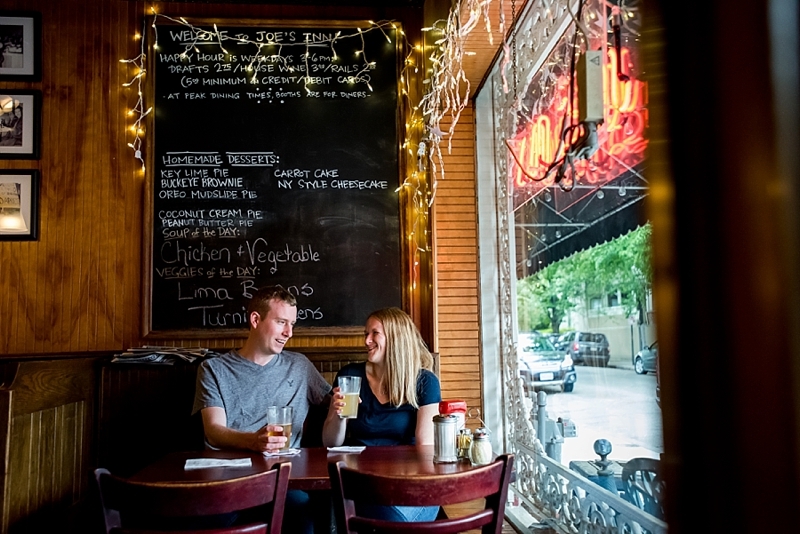 College campuses, the local watering hole, or even the corner diner are all types of locations that will want to hear of your awesome love story. These locations are usually inviting to be part of scenery. Afterwards, be sure to tag the local business/spot on social media, so they can celebrate your love story, too. If you are planning a more formal wedding, it could be fun to dress it up for your engagement session as well. You can repurpose the outfits for your rehearsal dinner or find a new inspiring ensemble! Some brides like to do a trial with their makeup or hair artist, and engagement sessions are the perfect occasions to try out a look. It's a win win! Our jobs consume roughly a third of our lives. A hard day’s work can be celebrated by incorporating your job into your session, especially when they're in public service. Some of the best marriages happen when you have a strong support system behind you, and it's beautifully captured on camera. 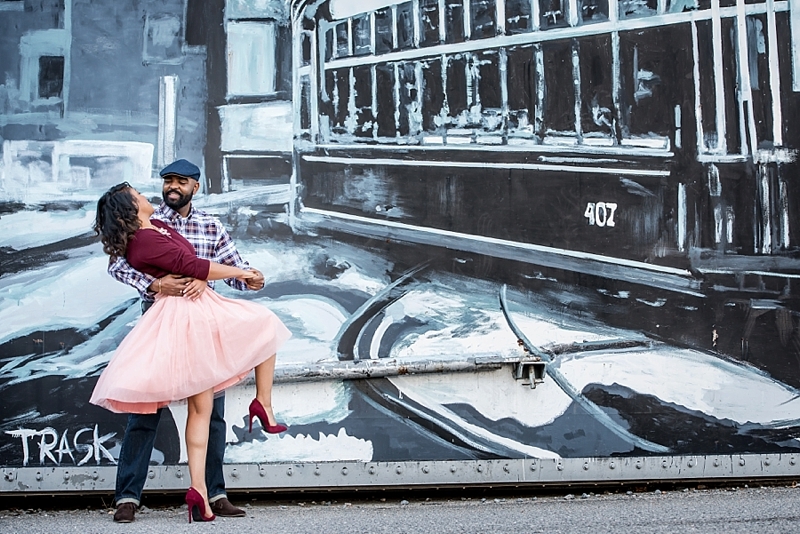 An engagement session is successful when you and your partner ultimately want to showcase your love and connection to each other. Oftentimes, I snap close-ups of intertwined hands and warm embraces, making the background insignificant. Regardless of location or outfits, if you allow your love to shine through with the perfect-for-you skilled photographer, it's something that you will remember for a lifetime and more. All photos taken by Awesomesauce Photography. With years of wedding photog experience, Linda is the Richmond-based guru behind Awesomesauce Photography. Get to know her and her love for authentic moments on her website and on Instagram.